Expand the theming to the emails. Actually the email template has some inline styles. Release these styles to an separate CSS and include the CSS in the sent emails. Further the CSS should have classes to style links as buttons. 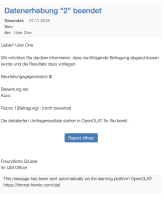 The styles should apply in the OpenOLAT mailbox as well. The CSS should be generetaded by the same tool as the themes (SASS). Button to reset the e-mail template. Preview of a styled e-mail.